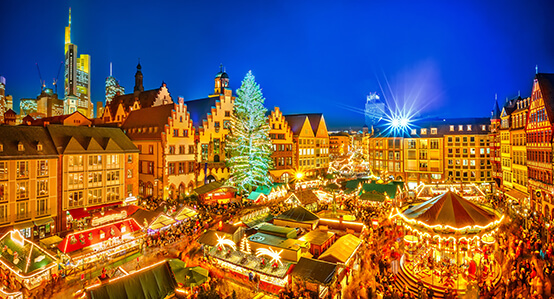 Immerse yourself in the festive traditions of Germany at Christmastime, where the air is perfumed with the tempting aromas of mulled wine and gingerbread, the streets are colorfully aglow in glistening lights, and the angelic Christkindl holds court in a country bedecked in Christmas regalia. 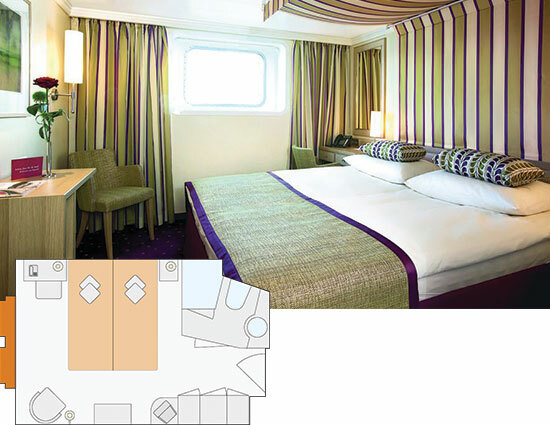 4-night Hotel Accommodations: On land portion based on twin/double accommodations in moderate hotels. 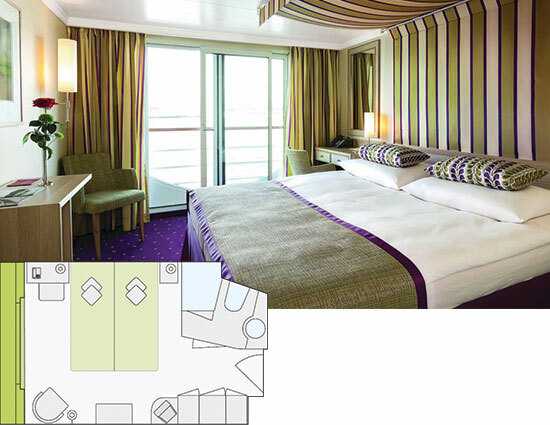 Meals & Beverages: All meals and most drinks while on the cruise, daily breakfast and select meals on the land portion. Premium beverage package during the cruise includes unlimited beverages all day for soft drinks, water, juices, coffee/tea including specialty coffees and espresso drinks. Wine, Beer and mixed drinks by the glass. Few, select ultra premium beverage upgrades are excluded from the beverages package but may be purchased against surcharges. Note: (B, L, D) as noted at the end of itinerary text indicates meals included for that day. All meals on cruise are included. 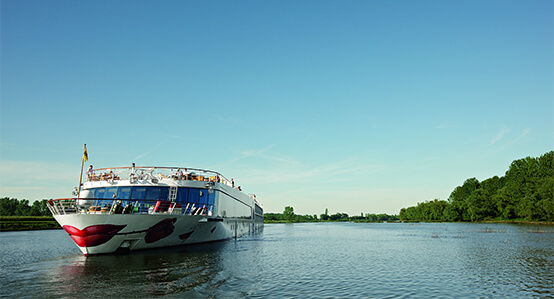 Onboard Credit: Enjoy 60 Euro per couple spending money to use on board the A-ROSA ship as you please for spa treatments, bike rentals or upgraded beverages. YMT guests will also receive 15% discount on all Spa treatments. Service: A professionally trained tour director who is knowledgeable on the local area and will provide you with a wealth of information. Their friendly service will make your trip a memorable experience. *Web prices reflect instant rebate pricing. 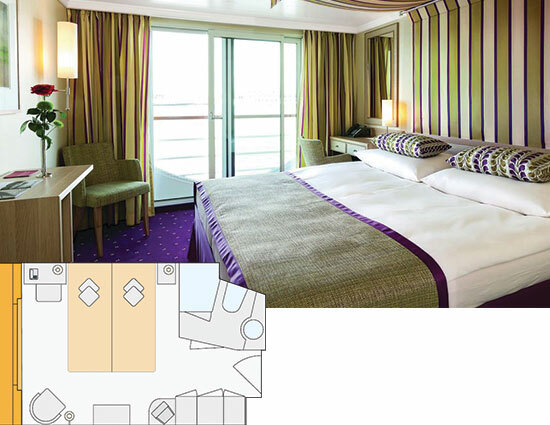 All Set Sail offers are available for all cabin types, Onboard discount valid on all spa treatments. Offers valid for new bookings only and subject to availability. Offer may be cancelled at any time. Please follow the steps below to price your vacation with YMT. When you complete all the steps, please click "Reserve" next to the date. Your journey begins on an overnight flight to Germany. Today is at your leisure until an afternoon embarkation. We recommend partaking in Kölsch, Cologne’s official beer, served in a traditional 200ml glass called a Stangen. “Zum wohl” means “to your health,” and is a very common toast in Cologne. Board the Silva in the afternoon, where you will be greeted with a perfect red rose from the ship’s crew, per A-ROSA tradition. 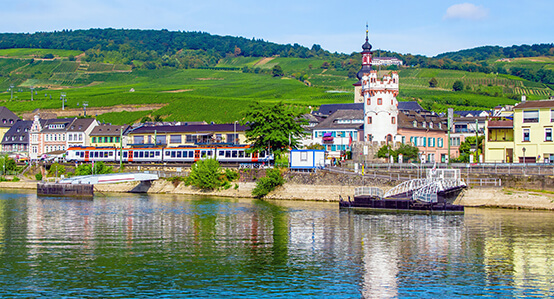 Surrounded by gently sloping vineyards, Rüdesheim is famous for its local wine, brandy, and specialty coffee. The Drosselgasse, with its taverns and restaurants, makes for a very lively pit stop and provides ample opportunity to enjoy the local goods and 25-year-old Christmas Market. 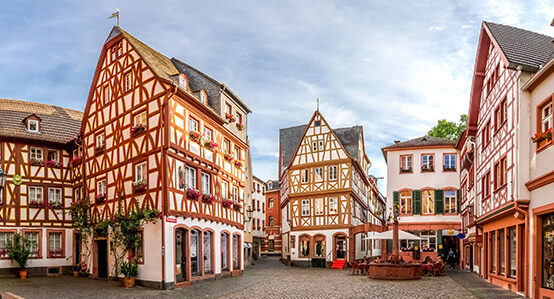 Your next stop is ancient Mainz, best known for three outstanding features: its Romanesque cathedral, two original Gutenberg bibles, and the Rhineland carnival. Find the charming Christmas Market by searching for Mainz’s 30-foot-tall Christmas pyramid. This charming international city is full of museums, shops, and restaurants that cater to English speakers. But perhaps the best highlight of Frankfurt during this time of year is its famous Christmas Market. First started in 1393, it is one of the world’s oldest and a spectacular must-see during your tour. With over 60 medieval castles overlooking its winding banks, the River Rhine valley is one of Europe’s most breathtaking landscapes and now a UNESCO World Heritage Site. Quaint villages are nestled alongside the majestic river, while never-ending vineyards flank the hillsides. 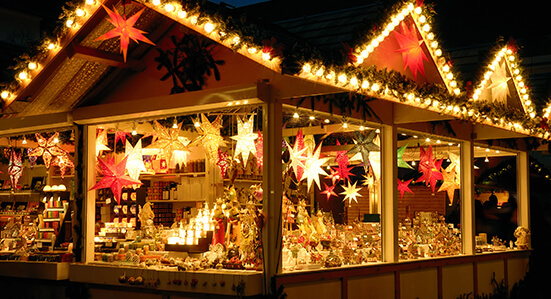 Visit Koblenz’s older areas, Münzplatz, Plan, Rathausplatz, Liebfrauenkirche, Jesuitenplatz, and Zentralplatz, to see an especially charming Christmas Market that features over 100 festive stands, styled to look like adorable Christmas cottages. 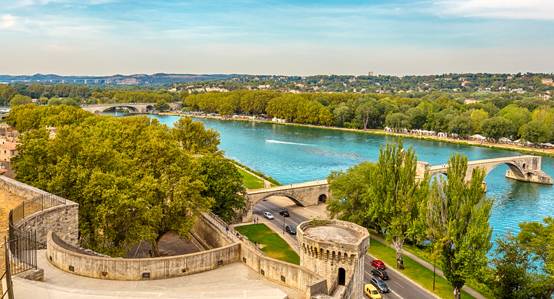 Springtime in Paris followed by a river cruise through the heart of Provence and French wine country. Sounds perfect, doesn’t it? This quick trip is designed to give travelers and complete experience of France in just 9 nights: Paris, Versailles, Dijon, Lyon, Avignon, and more! 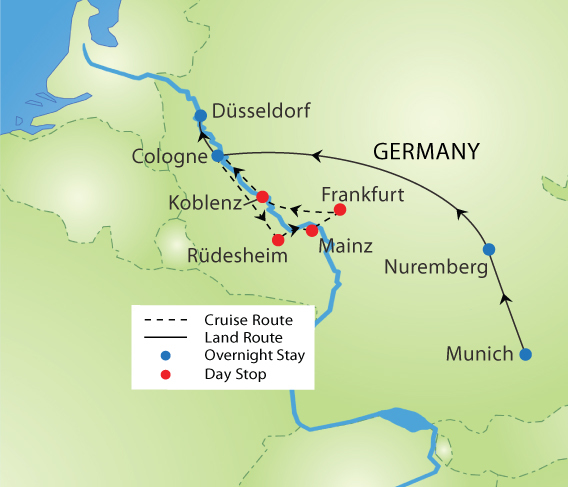 Journey through storybook Germany as you cruise through picture-perfect villages, grand castles, and a countryside that looks untouched by the modern world. 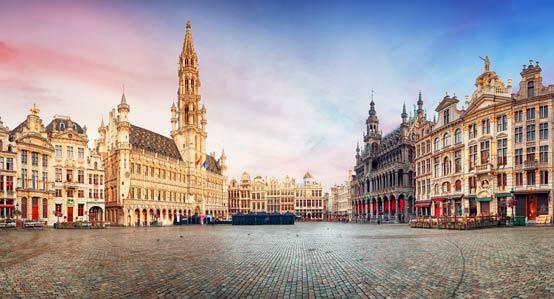 Enjoy an escorted land tour of Belgium, including a stop in a chocolate factory and gift of the best chocolate you've ever tasted! 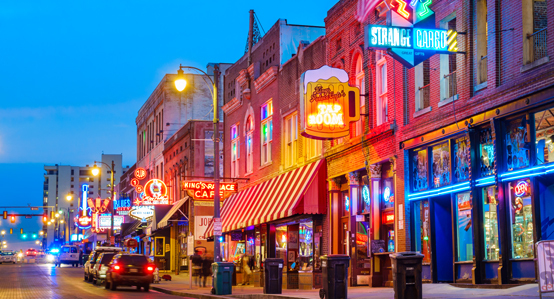 Travel down to the historic heart of the south in this music-filled trip through the birthplace of country music, jazz, the blues, and rock and roll. See the towns and streets that shaped America’s greatest artforms—music and history buffs alike will love this tour, where the south comes alive!